Snowshoes help us to trade in dreary city weather for the snowy wonderland of the mountains. While being stable and fun, snowshoes are the perfect tool to help you explore the untouched snow of the peaceful woods and vast glaciers. 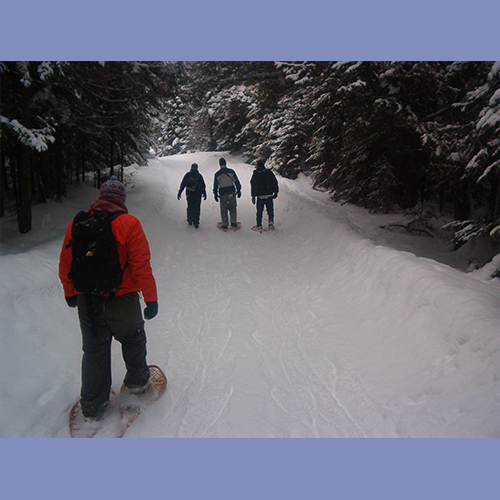 The best thing about snowshoeing is that it requires absolutely no prior experience or special physical ability. All you need is a sense for adventure and the willingness to get out there and do something incredible! Itinerary: Meet at 6pm, make sure waivers are completed, try on snowshoes, load the van and head for the destination on Mt Hood. Expect to leave no later than 6:20 pm. Arrive at snowshoe destination after a stop at restroom at 7:30pm. Begin snowshoe adventure by 7:45pm. Snowshoe for approx. 1 hour before stopping for a 20 min rest. During this “rest” period people have the chance to explore the immediate surroundings, while the guide prepares some sparkling apple juice, hot beverages such as cocoa and coffee, and healthy snacks. After our 20 min break we will gear up for another hour of snowshoeing on route back to the van. Return around 11:30 pm. Come dressed for winter weather. We recommend dressing similar to how you would to go skiing or snowboarding. Warm, waterproof hiking boots arerequired. We also recommend a small backpack to carry water and extra layers, but it can be provided if needed. Adventures (REA), 906 NW Corporate Dr. Traveling in 12 passenger vans to local area.